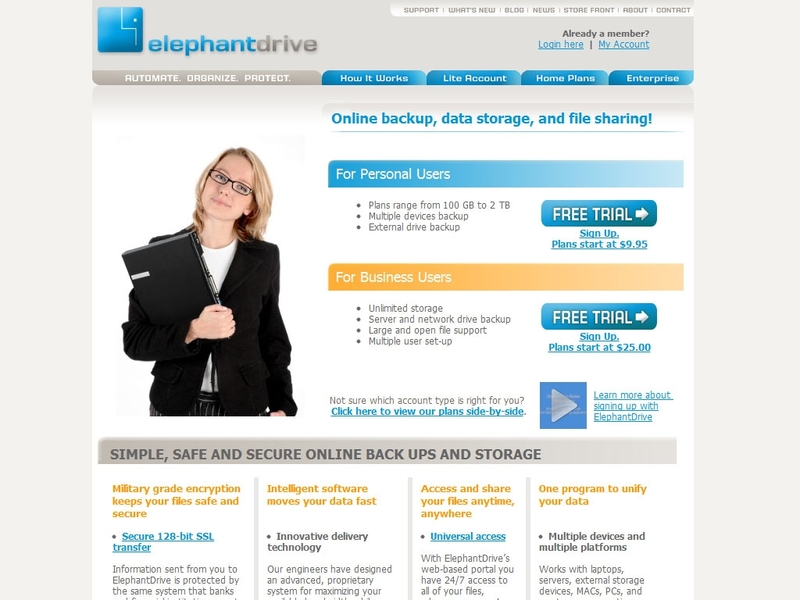 ElephantDrive is committed to providing individuals and businesses simple but powerful tools for protecting and accessing their data. We want ordinary people to enjoy the peace of mind that comes from the type of enterprise-class backup, storage, and data management that has historically only been available to big corporations. And we've made it so simple. Our service has a lot in common with the world's largest land mammal. When you subscribe to ElephantDrive, you get a service that is very big, never forgets, and works for peanuts! ElephantDrive was founded by a team of technologists who are passionate about developing world class software and fascinated by the challenges of storing, securing, and protecting massive amounts of data. We are based in Los Angeles and have worked together for years designing and deploying online applications. Information sent from you to ElephantDrive is protected by the same system that banks and financial institutions use to secure their transactions. Before transfer, your files are encrypted with the preferred algorithm of the U.S. government (approved for "Top Secret" use by the NSA). Our engineers have designed an advanced, proprietary system for maximizing your available bandwidth while minimizing the effects on your system. ElephantDrive recognizes which files are new or have been modified so that after your first backup completes, all future backups will go much faster. With ElephantDrive’s web-based portal you have 24/7 access to all of your files, wherever you are! Share any file with a single click (great for files that are too large to email), and set a password for extra security. Works with laptops, servers, external storage devices, MACs, PCs, and most server operating systems. Create independent sub-accounts with different access privileges (Business Plan required), and monitor your account activity and data usage. If you use or have used ElephantDrive in the past, please share this page using the buttons above and be sure to leave a rating and review of the service so other people can make an informed buying choice based on your experiences! It's free and you are not required to register! Unfortunately, nobody has reviewed ElephantDrive yet. If you have experience with ElephantDrive, we kindly ask that you please share your thoughts with others on this website by submitting an honest, detailed review. Your feedback will help prospective clients decide which service provider to choose and is incredibly valuable to the community itself as well as ElephantDrive's representatives that read this website. Please do not use this form for support inquiries. Be aware that these reviews may also be syndicated and displayed on ElephantDrive's website, and as such a strict review policy is in effect. All reviews are moderated prior to being published, and reviews that do not contain concise, detailed comments or do not support their associated ratings will not be published. We urge you to be as detailed as possible when leaving feedback, as ElephantDrive may also use this information as feedback for their business and are themselves encouraged to reply to reviews posted to their listings.